Left to right: Kelly Myszewski, Sylvester “Tre” Howard III, Arcelia Avechuco-Lopez, Jayden Riedel, & Michaela Korges. Contact the Phi Theta Kappa Advisor at your campus for more information. Each year students from the district are selected to represent CAC on the All-Arizona / All-USA Academic Team. Those students earn state-wide acclaim in the media and attend a celebratory luncheon that is also attended by many CAC dignitaries. In some years, a CAC student has even been spotlighted for international recognition. These are the special awardees that you might have seen pictured in USA Today. But they are not the only winners. Application materials will become available on the Phi Theta Kappa website in October. Every Arizona student on any of the All-Arizona/All-USA Academic Team is awarded a two-year scholarship to the student’s choice of one of our three state universities. ASU, UofA, and NAU are very pleased to welcome these academic stars to their campus. In addition, all five CAC awardees receive a cash scholarship as well. Because the pay-off is so substantial, the competition is keen. Each applicant must complete an application package, which typically includes demographic data, GPA, essays on a designated topics, and letters of recommendation, as well as whatever else the national committee has designated as competition requirements. Sponsored by Phi Theta Kappa, the American Association of Community Colleges and USA Today, the All-USA Team’s national committee also establishes guidelines for criteria by which applications will be evaluated. 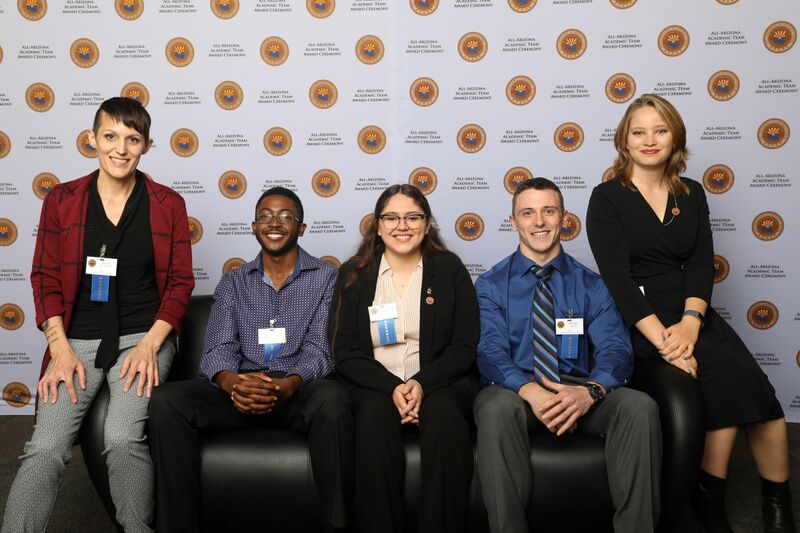 Although applicants are not required to be members of Phi Theta Kappa, CAC designates the Phi Theta Kappa Advisor(s) at each campus to coordinate the application process, and the Honors Director selects a team to evaluate the applications. Students at all five campuses have the same deadlines and the same written requirements. The application requirements are somewhat different each year. In addition to achieving well academically, selected applicants have contributed to their community and are able to express themselves well. Involvement in the Honors Program and PTK help develop these skills. Completing a scholarship application package is not an easy process. It takes time and skill. That skill is developed by students during the process, usually with the help of the Phi Theta Kappa Advisor and other supportive campus staff. For many students it is the first time they have applied for a large scholarship. Students learn so much from the application process that it could be said that everyone is a winner. Those who applied, but were not selected are much better prepared to submit successful scholarship applications in the future. For specific information about requirements and timeline, see your Phi Theta Kappa Advisor or contact either Dr. Carol Johnson, Professor of Honors, 520-494-5108, carol.johnson8@centralaz.edu or the Honors office, 520-494-5380, honors.education@centralaz.edu. ALL USA Scholarship workshops by Professor Heather Moulton- Schedule to be posted soon!